HispanicNashville.com: Are there Spanish conversation groups in Nashville? Are there Spanish conversation groups in Nashville? This is one of the most frequently asked questions of HispanicNashville.com: Are there Spanish conversation groups in Nashville? Charlemos Spanish, a conversation group for all ages, meets at the Palette Gallery 'n' Café (2119 Belcourt Ave. in Hillsboro Village) the second and fourth Thursday of each month from 5:30 to 7:00 p.m. There is no cost to attend or join. Each meeting begins with a presentation, in Spanish, by a guest speaker. For more about speakers, see our Program Speakers page. For a schedule of upcoming meetings, visit the Sister Cities Calendar. Please contact Elizabeth Worrell Braswell (elizworrell@comcast.net) for more information. Bienvenidos, amigos! If you're interested in the Spanish language and Latin culture, come to our meetups and get to know other folks with the same interests. We come from many different Latin American countries, Spain, and of course the U.S. With weekly meetups, regular salsa parties (with our own DJs), and the occasional movie or other activity, there are plenty of opportunities to practice your dusty old high school Spanish. Don't be shy! Come hang out with us. Questions? Send us an email. Everybody welcome. Sign up for the Conversemos Language Exchange Program! We have openings available for English speakers who need to improve their ability to communicate in Spanish (particularly conversation skills). Volunteer language mentors are willing to help you with Spanish, while you help them practice and improve their English. 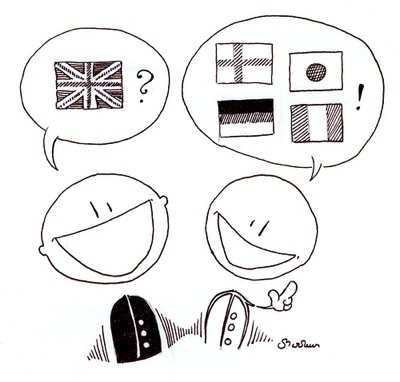 Illustration of multilingual conversation by Markus Koljonen. Licensed under Creative Commons.